We’ve been to Pastukhov Rocks today, 15,100ft above sea level. Unfortunately myself, Vladimir K and Vladimir B, the guide team on this trip, we can’t convince the Vicious and Delicious climbers that Elbrus is about anything other than hot. I have never seen temperatures quite as hot as we have today climbing to 15,000ft. The sky is cloudy, there has been some light rain, (lost transmission...) what we were telling the team to be prepared to wear, to carry in their packs or even start out wearing were totally worthless. I saw Vicious and Delicious climbers stripped down to their t-shirts, at high altitude today. Drinking all the water they could and only commenting about the heat. 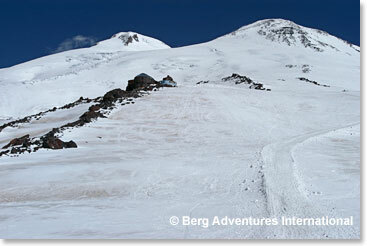 We can see Mount Elbrus above us, from time to time and we know that we will be trying to climb much higher. Good luck with the weather throughout this trip as you can tell from the dispatches and the reports we made and we are going to count on that continuing. I am still going on a dinner tonight and try to convince these climbers that it will get cold on Mount Elbrus, I am sure it is going to eventually. Leila had great soup for us when we came down from our trip up to 15,000ft today and we are going to take a little break now and we are going to have a great dinner at 8pm. Tomorrow is a break day, training day, for harnesses and other equipment that we will need as we move higher, a rest day after a good long day today, we were tired when we got back down and it felt good. Team is doing great, everybody is in great spirits. Our goal today was Pastukhov Rocks at 15,100ft. Ways to keep cool on Mount Elbrus on a very hot day!